And you can’t even see the yarn! But it’s in plastic storage bins and drawers and almost all actually fits in the closet. The pro? 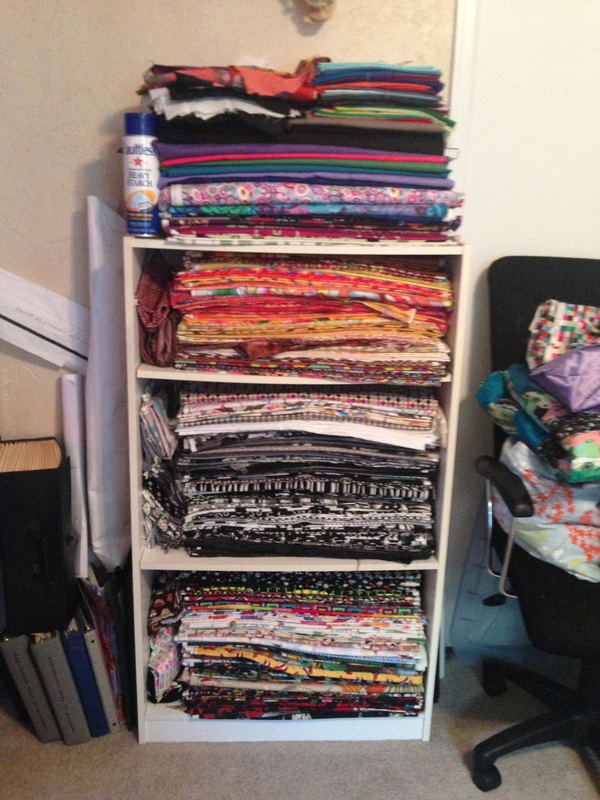 I found lots of treasures, including a 4 pack of batik FQs I got in a grab bag, and all of my fabulous solid stacks from the now defunct Pink Chalk Fabrics Solids club- the current version involves prints as well. Anyway! 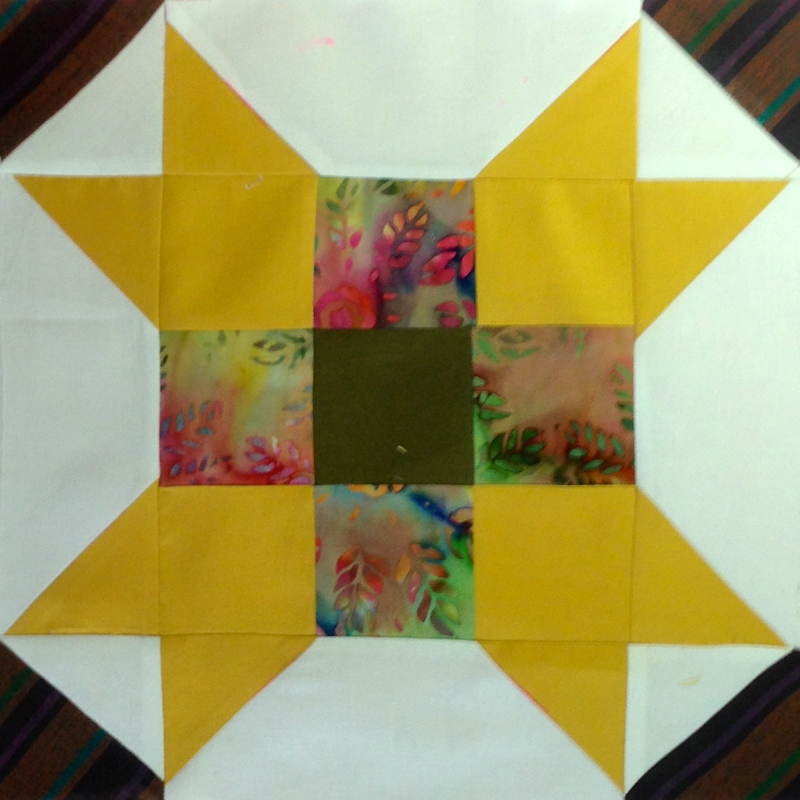 There was a very autumnal batch, not my cup of tea (lots of brown and yellow) that would work with those batiks… And I’d been meaning to make my mom a new quilt for her “new” (year old now) couch anyway… So I started pulling and playing… And came up with this. 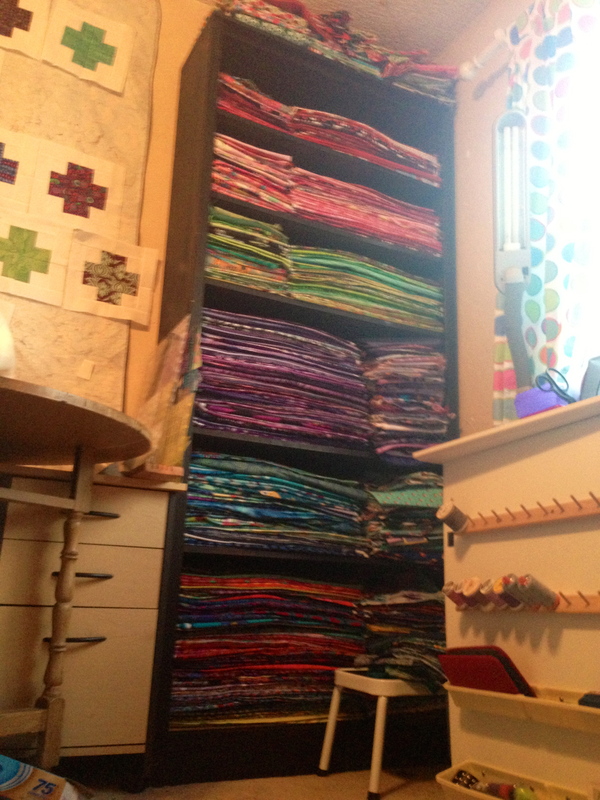 It’s an eclectic mix… the batiks, the solids, some Kaffe stripes and one print, and a two other very random pulled from stash pieces (the purple one has elephants on it! ), on a slightly off white back. What to do with them? Well, that choice was easier! 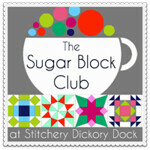 I decided to make a 2nd Sugar Block quilt. I feel like I can commit to 2 blocks a month, and hopefully that means I’ll have an xmas gift for my mom by the time all the blocks are released. So, if you know her, shhh! My seam ripper got a serious workout, as I sewed on 2 of the flying geese units backward. Go, me. Nothing like staying super humble. 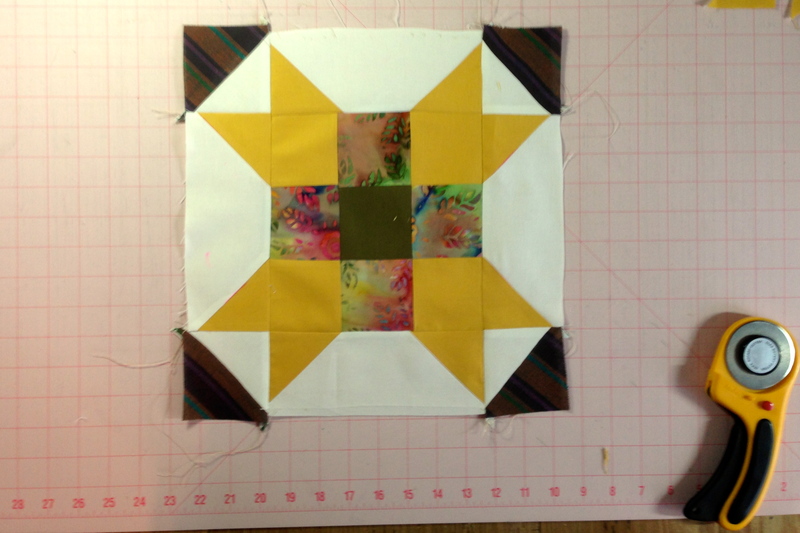 All in all, I think it came out okay… Perhaps working on these blocks all year will help me improve my precision. I did bust out the spray starch today, and I do think it helped. I have the same problem when all my stuff is cleaned up and organized! I never want to touch it and mess it up! Of course now it is in piles everywhere again….already 🙂 Also, your block looks lovely! It’s a catch-22! Hard, and not fun, to work in mess� But working makes a mess! Having the goal of posting work on a blog again is keeping me sewing- and having commentors to chat with is great, too!